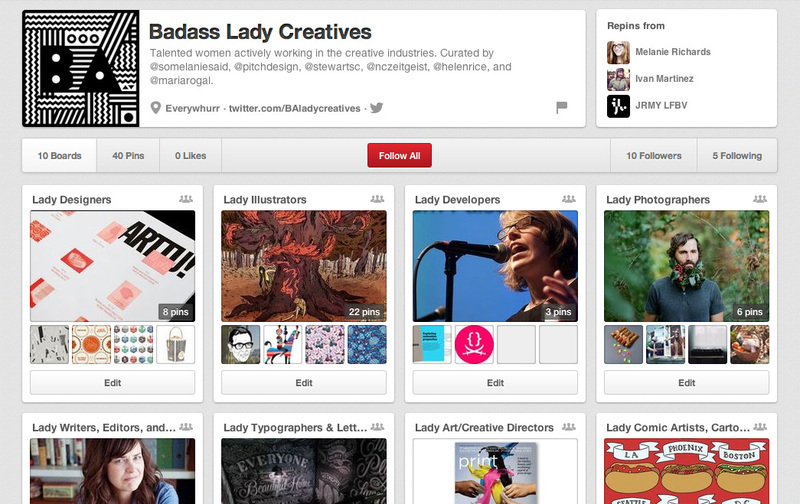 I’m pleased to announce that Badass Lady Creatives is a thing that exists on the Internet! In the recent past there’s been some drama about lack of female speakers and panelists at conferences in the creative/tech industries. What often goes unnoticed—and which I find more telling—are the small, pervasive ways in which praise, accolades, and respect are unevenly distributed. The aim of Badass Lady Creatives is to celebrate a wider set of talented individuals. It’s not a fix-all—and there are other worthy topics, re: diversity—but it’s a start. At this moment, there is a Pinterest account that will serve as a directory of actively-working creative women, and a Twitter account that will share our favorite pins and news from said ladies. If these networks are not your thing, never fear: I/we are hoping to expand to other media, as well. Speaking of we, I’m so grateful to have some design-comrades curating this directory along with me. Many thanks to Margot Harrington, Joseph Hughes, Dylan Lathrop, Helen Rice, Maria Rogal, and Stewart Scott-Curran for coming on board with this project! Though the first pins are very US/UK-centric, we plan to feature women on an international scope. Our definition of women is fluid. If you call yourself a lady, you are one. This is a merit-based project. Women will be featured because they are good at what they do.